The Carolina Boat Lift is built by Custom Dock Systems in Upstate, SC and is one of the strongest, most stable boat lifts in the industry. We are proud to offer the Carolina Boat Lift™ by Carolina Lift Systems, Inc. As the name reflects, it is built to withstand the conditions of our area. As a previous top-selling dealer for other brands of boat lifts, we have capitalized on our knowledge and experience and have now designed and are manufacturing a refined, improved boat lift. We use a water/air displacement design with a unique, up-pressure, locking-arm mechanism (patent pending) to eliminate the bouncing, squeaking, and attachment fatigue of our competitors’ lifts. This up-pressure arm system also has the ability to be padlocked for security or extended storage. This unique feature gives us complete confidence that your boat cannot be lowered while you are away. Our lift in the up position keeps all steel components out of the water, eliminating deterioration and costly repairs. All steel components are manufactured in our plant, then hot-dip galvanized, assuring you the highest possible quality. 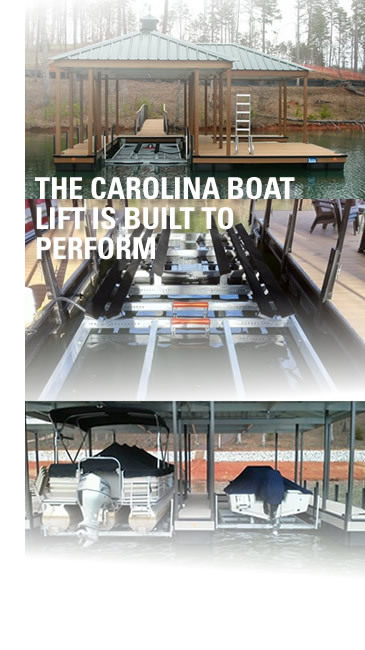 The Carolina Boat Lift™ is one of the strongest, most stable lifts in the industry. It is often sought after for the roughest water areas. With the up-pressure technique, the lift will add stability to the dock system, especially the lighter weight aluminum structures. The bow sections of the lift can be decked to add an extra sitting area, to provide extra storage space, or to assist in applying or removing canvas boat covers. The standard lifting capacity of our lift is 6500 lbs. That’s over 2000 lbs. more lift than our competitors’ standard lifts. We can offer more pounds of lift per dollar than any of the other major-brand lift manufacturers. Our lift offers you complete peace of mind for your boat’s protection. Please contact one of our professionals today at 800.706.7397 or email us to get started on your project today.